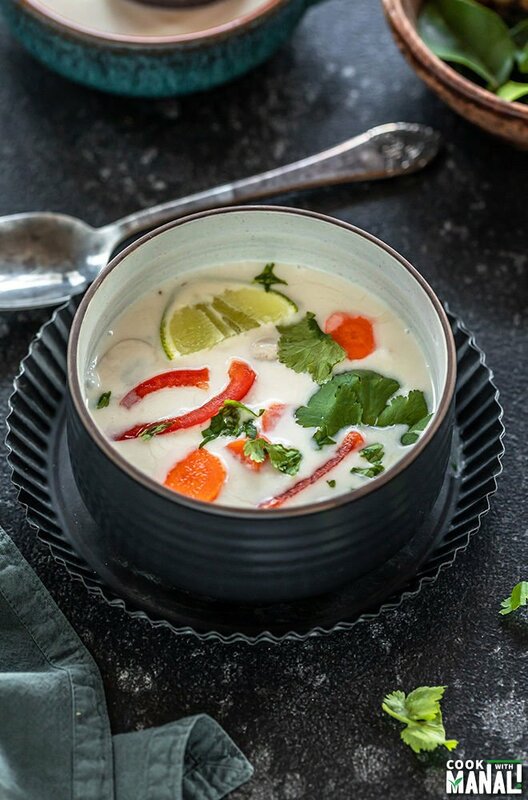 Vegan Tom Kha Gai aka Thai Coconut Soup is creamy, delicious and has so much flavor to it. You only need the right ingredients to make this at home in no time! January is a hard month to get through. There are many reasons for this. One, it’s the first month after the holidays and it’s hard to get back to work and daily life. And two it’s so dark and cold that basically you just can’t wait for spring! Oh well, what gets me through these days is hot soups! I love having soups for dinner, Sarvesh not so much. He is not a soup person, so I usually make soups for myself. 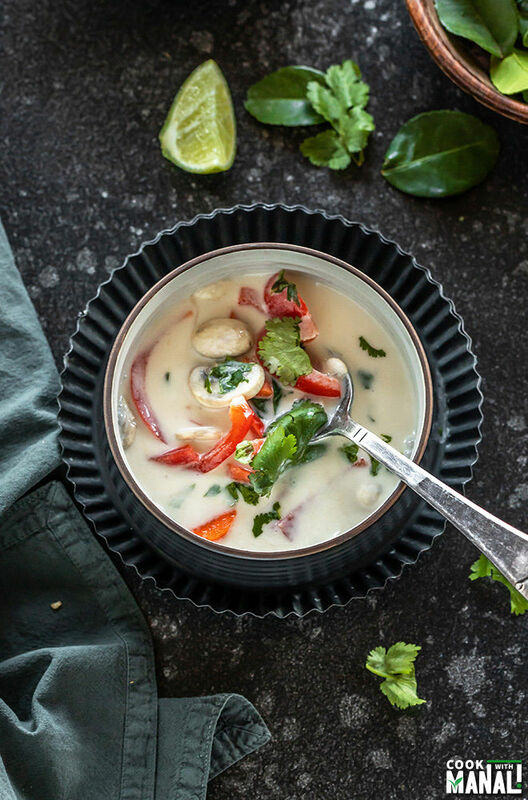 One of my favorite soups these days is this Thai Coconut Soup, also known as Tom Kha. This soup is very lightly seasoned and most of the flavors for this Vegan Tom Kha Gai comes from using fresh ingredients used in Thai cooking. Now, I know a lot of ingredients in the list like galangal, lemongrass, kaffir lime leaves are not something that you would find in any grocery store. But trust me, these ingredients make all the difference! If you love Thai food and want to make it at home, I suggest you find a good Asian store near you. Luckily, I have a lot of Asian stores in my area so it’s not difficult to find these ingredients at all. 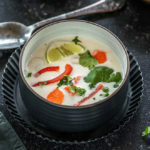 Tom Kha or Tom Kha Gai is a coconut milk based thai soup. It’s a mix of tart, sweet and spicy flavors. Traditionally and the most common version involves chicken but since I am a vegetarian, I always opt for the vegetarian version of the soup. 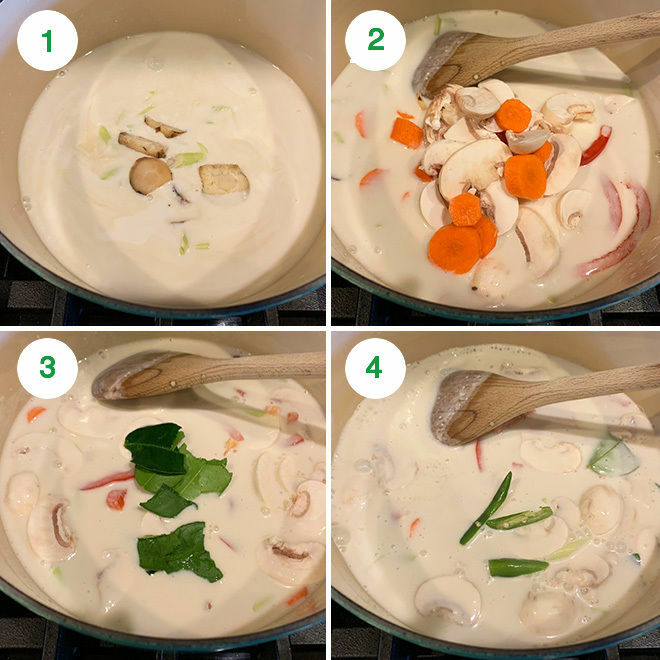 The vegetarian or vegan tom kha gai has lots of veggies tossed in a creamy coconut soup. It’s super flavorful and very comforting! It’s one of the most popular Thai soups or for that matter one of the most popular Thai dish. 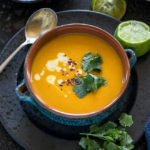 The base of the soup is made with creamy coconut milk and ingredients like galangal, lemongrass and kaffir lime leaves help bring out it’s unique flavor. In my opinion, these ingredients are key to making a good Tom Kha and can’t be substituted. 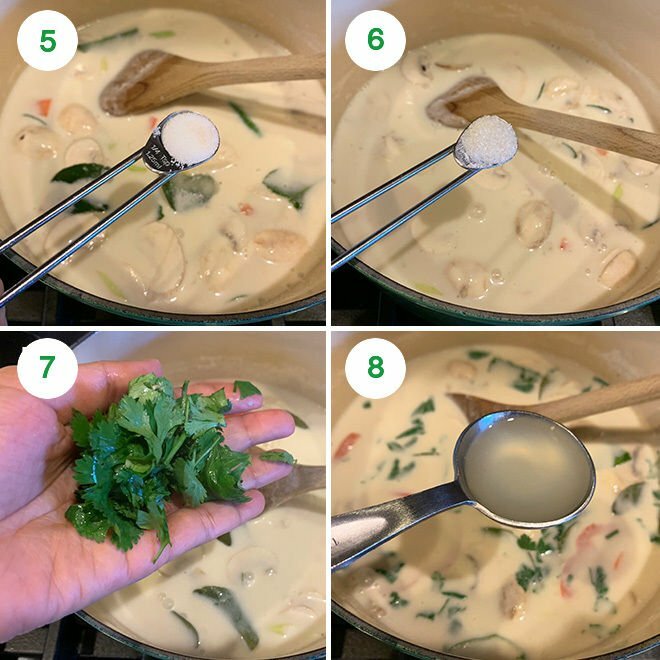 However, if you still really want to make Tom Kha and can’t find these ingredients, substitute galangal with ginger and use more lime juice (in addition to what’s already used in the recipe) in place of the lime leaves. To make this vegan tom kha gai soup is really easy. It’s a 15 to 20 minute process and you end up with a simmering pot of delicious soup. We simmer the broth until it absorbs all the flavors of the lemongrass and galangal and then add the veggies and simmer some more until they are cooked. It’s pretty simple. I make the soup completely and then discard the lemon grass and galangal before serving (they are hard and need to be removed). You can also do this the other way. Make the broth first, strain it and then add the veggies and simmer until they are cooked. Either way, it would turn out great. This soup has a interesting mix of flavors. It has that sweet creamy flavor from coconut milk and sugar (if using). Then it has the heat from the thai chilies and tartness from the kaffir lime leaves and lime juice. All these flavors should be well balanced, that’s what makes this soup so special. 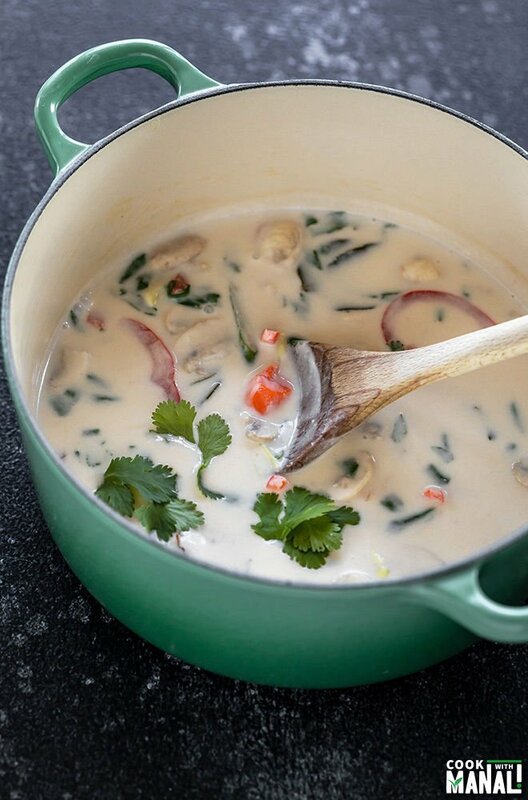 A lot of recipes calls for exclusively using coconut milk for Tom Kha. I have used coconut milk (of course) but I have also used a lot of vegetable broth. I personally don’t like a super intense coconut flavor so this works for me. If you want the soup to be creamier and also enjoy coconut flavor, skip the broth and use only coconut milk in the recipe. 1- Place a heavy bottom pan on medium heat and then add vegetable broth, coconut milk, cut lemongrass and slices of galangal to it. Let it come to a slow simmer, you do not want to boil the milk here. Let it heat through for 5 minutes. 2- Then add in the veggies-carrots, mushroom, pepper and stir. 3- Also add the kaffir lime leaves. Remember to tear/crush them before adding to the soup. That’s what brings out their flavor. 4- Add thai chilies as well. If you like spicy food, add more of the chilies. I like mine to be on the milder side. 5- Let the veggies simmer for around 6 to 7 minutes, then add the salt. 6- Also add the sugar (if using, I recommend it) and mix. Turn heat to low and simmer for 3 more minutes and then remove pot from heat. 7- Stir in the chopped cilantro and mix. 8- Finally add in lime juice. Taste test and adjust spice level and salt to taste at this point. 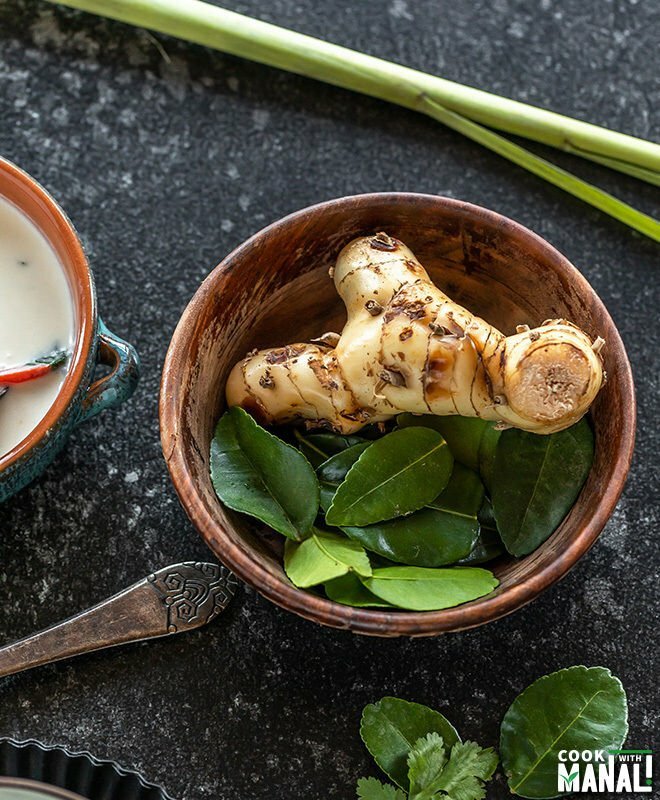 Discard lemongrass, galangal and serve vegan tom kha with more cilantro and a lime wedge. 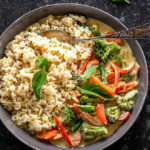 If you’ve tried this Vegan Tom Kha Gai Recipe then don’t forget to rate the recipe! You can also follow me on Facebook, Instagram to see what’s latest in my kitchen! 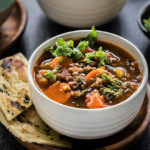 The vegan version of the popular Thai Soup! This Vegan Tom Kha Gai is packed with veggies and has tons of flavors - sweet, tart & spicy! So comforting! Place a heavy bottom pan on medium heat and then add vegetable broth, coconut milk, cut lemongrass and slices of galangal to it. Then add in the veggies-carrots, mushroom, pepper and stir. Also add the kaffir lime leaves. Remember to tear/crush them before adding to the soup. That's what brings out their flavor. Add thai chilies as well. If you like spicy food, add more of the chilies. I like mine to be on the milder side. Let the veggies simmer for around 6 to 7 minutes, then add the salt. Also add the sugar (if using, I recommend it) and mix. Turn heat to low and simmer for 3 more minutes and then remove pot from heat. Stir in the chopped cilantro and mix. Finally add in lime juice. Taste test and adjust spice level and salt to taste at this point. 1- This is the kind of soup that I like, if you don't want to add any broth and want it be totally creamy and coconut, add only coconut milk - so that will be 4 cups of coconut milk in the recipe. I don't like a very strong coconut flavor in my tom kha gai, so I thin it down with broth. 2- Adjust spice levels to taste. It should have a wonderful mix of spicy, tangy and little sweet. For a spicier soup, add more chilies. You can even add some red chili flakes. 3- You may also add tofu to the soup. 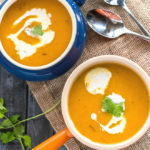 Soups made with coconut just taste amazing!